First and foremost, I would like to thank you for choosing to use TeachersDungeon as a part of your children’s learning plan. My dream is to give back to the world through the gift of my free educational game. By using this game, you are helping fulfill my dream – Thanks! 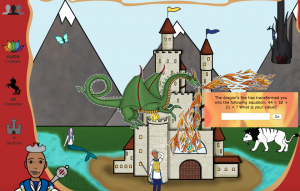 TeachersDungeon is an educational fantasy game that self-adjusts to each child’s level of academic ability, has video tutorials that correspond to specific questions, and gives teachers, parents, and the players access to all the educational statistics. Children battle the dragon that rules over TeachersDungeon. They earn magical crystals by answering standards-based questions correctly. 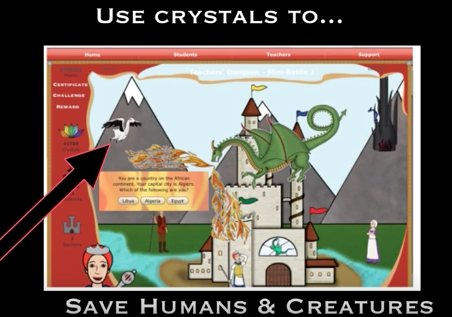 Crystals are used to save pets, people and mythical creatures from the dungeon. Players start as a blacksmith and work their way to king or queen. Children can even “Explain their Reasoning” – one of the most crucial aspects of the common core educational standards. For more information on how children can explain their reasoning, go to item (six) below and read – Teach your students how to create a convince me tutorial. This is an introduction to TeachersDungeon. It includes quick videos that show teachers, parents, and children how to use the different aspects of TeachersDungeon. Click on the photo above and go to our home page at teachersdungeon.com. You can Log into your teacher account using your email and password. Watch this quick video to learn how to create and edit your class. Watch this quick video to learn how to check your students’ stats. You can see how many questions they answered correctly. You can even see how they did in each subject: Math, English Language Arts, Science, and History/Social Studies. Watch this quick video to learn how to create a Dungeon Challenge. You can reward your students efforts with fun stuff like root beer floats, extra credit, a homework pass, or anything else you can think of that will motivate your students to do their best effort. INVITE YOUR PARENT TO JOIN IN ON THE FUN! Your students’ parents can create their own account. They can even link their parent account to their child’s account that you created for your class. Copy & paste the following email. I like to type each students name and personalize each email. However, you could make this email generic and just type “your child” in place of “student name”. You could even print it out and have the students write their user name & password on the paper. But to be honest, making the email personal is much more effective and it’s pretty quick and easy. I wanted to let you know about an extra credit opportunity. I am using an educational game called, TeachersDungeon. The game is completely free for teachers, parents, and students. It has questions that are aligned to the common core educational standards, and even show tutorial videos when children get a question wrong. I am giving all my students extra credit points for playing the game. You can help motivate (Student name). Create your own parent account – it’s 100% FREE. Challenge (Student’s name) to play the game every night for 15 to 20 minutes. You can even give your own reward, like pizza for dinner or free-time playing a favorite video game. Watch this quick video to learn how to create your parent account and link your account to (Student’s name). This is the coolest aspect of TeachersDungeon, because it reinforces the common core standard of “Explaining Your Reasoning”. Watch the video below. It will show your students how to make a video tutorial. Your students can explain why their answer is correct, and then submit their video to become part of the game. As a teacher, you will be able to see all your students’ convince me tutorials. Once approved, your students’ tutorials will become part of the TeachersDungeon game-play. If another player gets a question wrong for one of your student’s tutorials, they will watch your student’s tutorial and learn the solution for that problem. Click on the photo above and go to our home page at teachersdungeon.com. You can Log into your parent account using your email and password. Watch this quick video to learn how to edit your child’s information. If your child has an existing account with his or her teacher, this video will show you how to link your account to your child’s school account. Watch this quick video to learn how to create a Dungeon Challenge for your child. You can reward their efforts with fun stuff like banana splits, bike rides, or anything else you can think of that will motivate your child. This is the coolest aspect of TeachersDungeon, because it reinforces the common core standard of “Explaining Your Reasoning”. Watch the video below. It will show your child how to make a video tutorial. Your child can explain why their answer is correct, and then submit their video to become part of the game. As a parent, you will be able to see all your children’s convince me tutorials. Once approved, your child’s tutorial will become part of the TeachersDungeon game-play. If another player gets that question wrong, they will watch your child’s tutorial and learn the solution for that problem. Click on the photo above and go to our home page at teachersdungeon.com. You can Log into your student account using your USER NAME and PASSWORD. Watch this quick video to learn how to change the look of your avatar. You can also see how to use your crystals to work your way to king or queen. Watch this quick video to learn how to check your stats. This is the coolest part of TeachersDungeon, because you can act like the teacher! Watch the video below. It will show you how to make a video tutorial. You can explain why your answer is correct, and then submit your video to become part of the game. Once approved, your tutorial will become part of the TeachersDungeon game-play. If another player gets that question wrong, they will watch your tutorial and learn the solution for that problem. Watch this quick video to learn how to send and receive messages. Once again – I would like to thank you for using TeachersDungeon. Previous 3rd Grade Reading Help – Four simple steps to ensure your child will excel in reading?